I have been on the Camino Frances three times now. I suppose one of the first things I decide on before going is “which way do I go”. Well, there are plenty of yellow arrows and it is next to near impossible to get lost. However, a lot of people, including myself, like to have some sort of guidebook to read up on where we are going, and where we have been. They are very useful and I would always carry some sort of book while there. 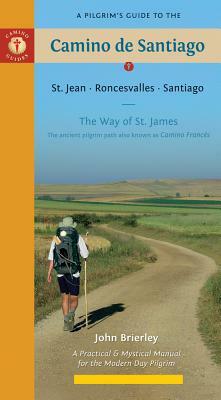 John Brierley’s books lead the way for most pilgrims. However, it acts as some kind of bible for some people. Pilgrims tend to follow the start and end points in the book and miss out on the great little towns in between. I brought this along on my first trip in 2011. It was pretty heavy, even though it contains pretty much “everything” related to the Camino. So for last year’s trip, I left it behind and brought along the Michelin guide. 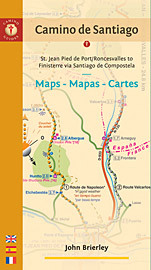 This is much lighter and contains maps and information on albergues. It is very much a stripped down Brierley guide and I used it every single day. At the time of writing, it is battered, worn and covered in notes in biro. The signs that it has done its’ job. So I brought along this in 2012 and this year. I recommend it highly. I have bought, this week, another Brierley guide which contains Maps and very small notes on each stage. It is 40 pages short compared to the original 250+ page book. However, the “recommended” stages are the same as the full guide and are different to the Michelin guide. 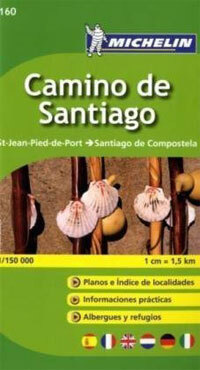 However, if you would rather not buy a guidebook and you want to keep your weight to a miniumum, I think http://www.caminoguide.net would interest you. Or you can download a Smartphone app. There are many different options.